Our customers are always asking for our advice on smartphones. Apple's iPhone is very user friendly and a great choice, and as a Canadian I really hope RIM succeeds with BlackBerry 10 but I'm concerned that they may be too late to the party to get a seat. But we're all Android fans since Android-based phones integrate so nicely to the Google Apps platform and the Google ecosystem as a whole. Android phones have been on the market since 2008 and in the third quarter of 2012 accounted for a full 72.4% of all smartphones. Yesterday I received the popular and hard-to-get Google Nexus 4 built by LG. The Nexus 4 (with 16GB of storage) costs just $359 in Canada (even less in the US), unlocked, and without a contract! It is a "pentaband" phone which means it works on nearly all GSM carriers worldwide! LTE is certainly faster than HSPA+, but using the Galaxy S3 and Nexus 4 phones side-by-side on media-intensive apps like Google+ the difference is barely noticeable. YouTube videos certainly start up a touch faster over LTE than HSPA+. The side by side usability difference is not sufficient to make me regret the purchase decision, and I love saving $220 over the outright price of $599 for the Samsung Galaxy S3. I also have the added benefit of getting the latest Android software directly from Google as soon as it's released, where S3 owners will have to wait months on end to receive Android 4.2 and its new features like Photo Sphere. Even my two year-old Google Nexus S received Google Now long before S3 owners did. The S3 also comes pre-loaded with carrier applications that you can disable but not remove. The Rogers Visual Voicemail plus app constantly nags you that it doesn't work over Wi-fi even if you don't have the service. Rogers also has to approve the S3 software updates which delays getting new features after Google releases them. The bottom line is I highly recommend the Nexus 4 smartphone for Canadians, and at its current price, there's almost no reason to buy anything else. Let's just hope LG and Google can catch up with the huge demand. I think it will have an impact on smartphone prices worldwide. Google's disruptive move, delivering a flagship phone for a value phone price, demonstrates their continued industry leadership and innovation. Speedtest.net Android application and Speedtest.net website on MacBook with Google Chrome used for testing. Nexus 4 Android version 4.2.1 on Rogers Wireless network using HSPA. Samsung Galaxy S3 Android version 4.1 on Rogers Wireless using LTE. Rogers LTE Hotspot Sierra Wireless Aircard 763S tethered via USB to a Macbook Pro. Wi-Fi Hotspot speed test results were lower than USB. 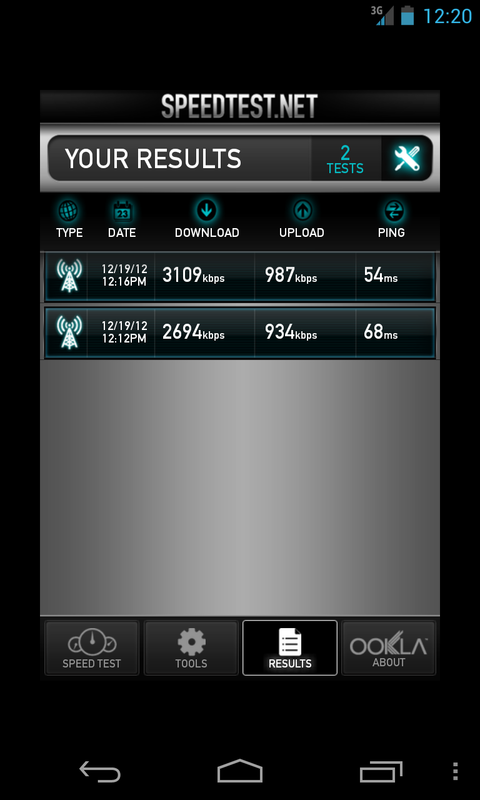 Rogers LTE has a theoretical download speed of 100 Mbps. 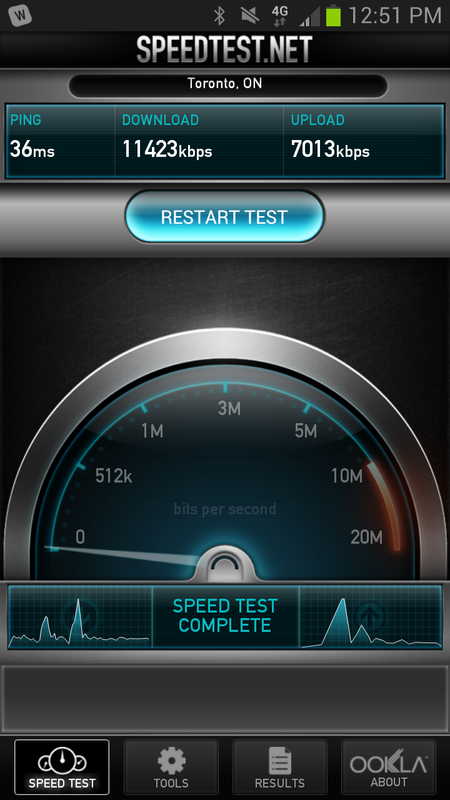 Rogers HSPA has a theoretical speed limit of 21 Mbps. 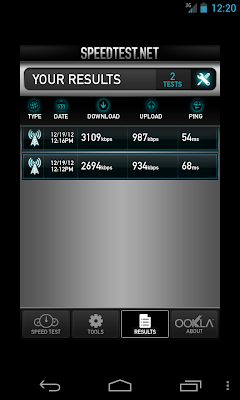 The LG Nexus 4 has HSPA+, capable of 42Mbps speeds. 1 Mbps = 1024 Kbps. Nexus 4 LTE hack was not tested since it causes other issues like breaking Google Now. Your results will vary depending on your location and time of day. This was done on the window sill in our office in Mississauga where I show 3 out of 4 bars on the Nexus 4.